Shortly after two o’clock this afternoon I was admitted to the degree of Doctor of Philosophy at the Senate House in Cambridge, one of 52 PhDs admitted in person at a Congregation of Regent House. Originally there were only five kinds of doctor at Cambridge: Doctors of Divinity, Doctors of Canon Law, Doctors of Civil Law, Doctors of Medicine and Doctors of Music. The degree of Master of Arts was originally considered equivalent to the doctor’s degree in the other faculties. However, over time the MA became debased in value, and today admission to the MA is virtually automatic for all Cambridge graduates, who may be admitted to it six years after their first matriculation. However, the MA does retain some importance as it qualifies its recipient to participate in debates in the Regent House (the governing body of the University) and to vote in University elections. It also allows its recipient to borrow books from the University Library and qualifies him or her to teach within the University and proceed to the higher degrees. 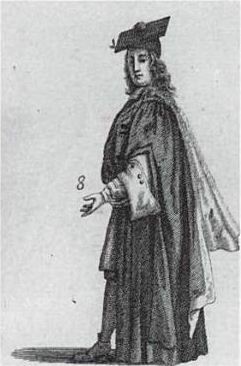 A Master of Arts in 1690, from David Loggan’s Cantabrigia Illustrata. The dress of an MA remains essentially unchanged. The degree of Doctor of Philosophy is a relatively recent innovation at Cambridge. Italian universities, such as Padua, created Doctors of Philosophy from the Middle Ages onwards, and in the 19th century the degree became associated with German and American universities. Cambridge began to permit Doctors of Philosophy from other universities teaching at Cambridge to use the title ‘Doctor’ in 1882, and before, during and after the First World War there was much debate about the merits of Cambridge creating a PhD. This finally happened in 1920. The PhD was needed because the MA had become increasingly nominal, and it was felt that a doctorate ought to be available that was awarded on the basis of research. Up to that point, the existing doctorates had been awarded to individuals primarily because of the positions they occupied in the hierarchy of the University. The PhD is thus the university’s highest research degree, examined by both a written thesis and a viva voce examination. The requirement that a supplicant for a doctor’s degree should defend his thesis in person was an ancient one, but from the late 17th century this gradually fell into abeyance; the PhD thus revived the original spirit of the doctorate. The ancient doctorates of the University, together with the later LittD and ScD, are now largely honorary degrees, bestowed on their recipients for notable contributions to their area of study. The PhD is the highest degree for which someone can actually study at Cambridge, and PhDs are awarded to students from every faculty (in my case, the Faculty of History). The exception is the Faculty of Medicine, which still awards MDs for research. This was my third graduation in the Senate House; I graduated Bachelor of Arts in 2002 and Master of Arts in 2006. Furthermore, I also attended my sister’s BA and MA graduations and my wife’s MA graduation, so I have become quite familiar with the ceremony. The ceremony is formally a Congregation of the Regent House, the ‘parliament’ of the University; technically the graduations happen within this Congregation. Graduands process from their colleges, led by the Praelector (a fellow of the college whose job it is to present candidates for degrees). My college, Gonville and Caius, is the closest to the Senate House and the procession lasted for approximately 40 seconds. Once inside the Senate House, the Praelector presents the candidates to the Pro-Vice-Chancellor (Procancellarius) in Latin, pledging that he knows the candidates to be worthy of receiving their degrees, not just for their learning but also for their morals. The Pro-Vice-Chancellor is usually a ‘head of house’ (master of a college) representing the Vice-Chancellor, who wears the cappa magna, a red robe with a white fur cape closed at the front; this is the most ancient form of academical dress in any university in the world. The Pro-Vice-Chancellor is invested by the Vice-Chancellor with the power to admit to degrees, which he or she does by placing his or her hands over the hands of the kneeling graduand, pronouncing the Trinitarian formula Auctoritate mihi commissa, admitto te ad gradum doctoris in philosophia, in nomine Patris et Filii et Spiritus Sancti. Today, the Pro-Vice-Chancellor was the Master of Corpus Christi College, Stuart Laing. Once a graduand has been formally admitted to a degree, he or she stands up and bows to the Pro-Vice-Chancellor before exiting via the ‘Doctors’ Door’ of the Senate House into Senate House Lane. I was delighted to find that my Director of Studies at Caius when I was an undergraduate, Dr Jimmy Altham, was waiting in Senate House Lane to shake my hand, just as he did in 2002 when I graduated Bachelor of Arts. In this picture I am wearing the full festal academical dress of a Doctor of Philosophy: a black morning coat and black silk waistcoat with a white bow tie and bands, together with the festal gown of a Doctor of Philosophy, the hood of a Doctor of Philosophy, and a Doctor’s bonnet. 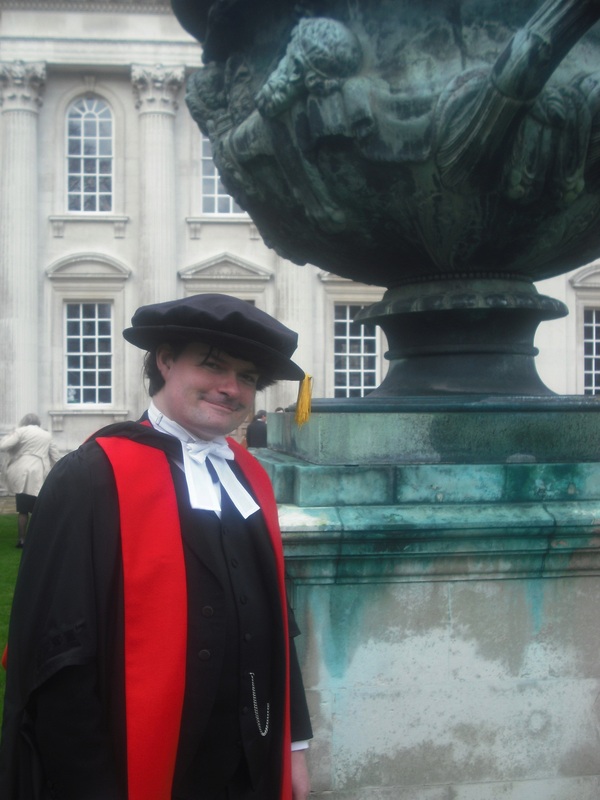 Inside the Senate House, however, I wore the hood of a Master of Arts (lined with white silk) over the plain black MA gown, as graduands who have a previous Cambridge degree wear the gown and hood of their previous degree. Technically, the festal gown should only be worn on a Scarlet Day (days when the Vice-Chancellor decrees festal gowns should be worn), and 25th January, although it is the Feast of the Conversion of St Paul, does not count as one of these. The festal gown of a Doctor of Philosophy should be the gown of a Master of Arts, of black silk, with four inch-wide facings of scarlet wool all the way down the front. Since 2010 the University has officially permitted doctors to wear these facings as detachable features on the front of the undress PhD gown, which is identical to the gown of a Master of Arts except that it features a band of ‘Doctors’ lace, four inches in length, placed horizontally above each arm-slit, the bottom edge of the lace being three inches from the edge of the opening’. My gown is of this hybrid type, featuring both Doctors’ lace on the sleeves and the festal facings. This is now the most popular type of PhD gown in the University, since no-one wants to buy two gowns when they could have one. The PhD hood is made of black corded silk lined with red wool, although no hood is actually made of real silk nowadays. The Doctor’s bonnet, like the festal gown, is worn only on Scarlet Days. It is a ‘Tudor bonnet’ of black velvet with a gold cord and tassel. The use of a bonnet of this shape originated in Cambridge in the sixteenth century, when the ‘secular’ doctors (of Laws, Medicine and Music) started wearing them to differentiate themselves from the square caps of the Doctors of Divinity, and it has now spread to many other universities around the world. Oxford’s doctors, by contrast, wear a Tudor bonnet with a black ribbon. On occasions other than Scarlet Days, the official headwear of a Doctor of Philosophy is the plain square (called a ‘mortarboard’ outside Cambridge), just as it is for undergraduates, bachelors and masters. However, academical headwear has fallen almost completely out of fashion in Cambridge and is now rarely seen except inside the Senate House, where University officials still wear squares and, indeed, doff them to one another at various points in the ceremony. Thank you for posting this. A very interesting read. This entry was posted on January 25, 2014 by jacobite.